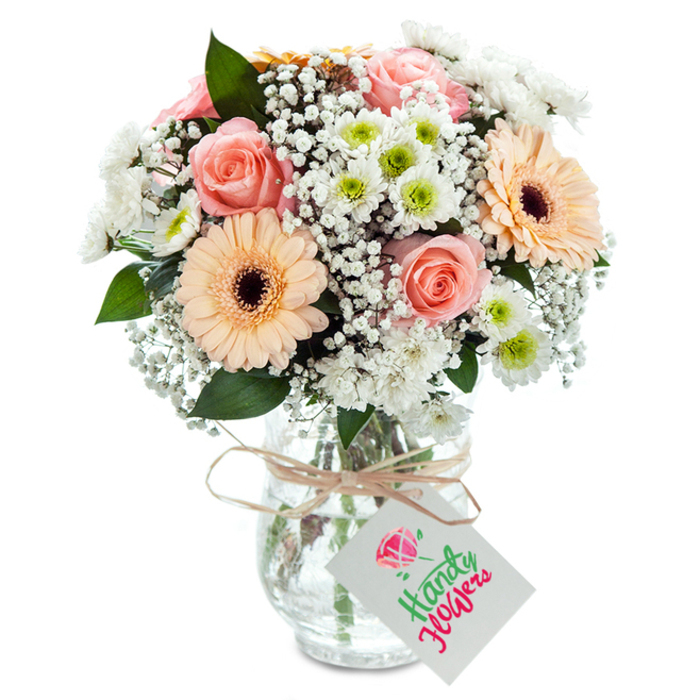 The wonderful selection and sweetness of this bouquet make it a great gift for any occasion. 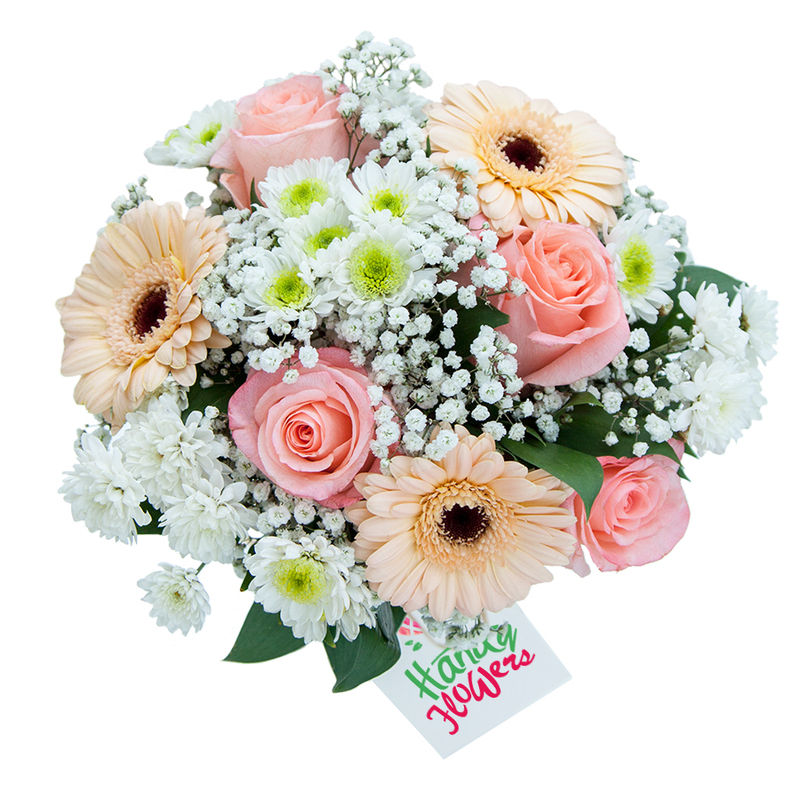 It's a perfect combination between 3 Peach Germini, 4 Silky Pink roses, gypsophila and White Spray Chrysanthemums. Original and Grand sizes available, not pictured. Everything was perfectly arranged! Flowers were put together in a way ensuring they couldn't fall apart. wonderful job! The birthday flowers arrived safely. Good florist to order from. I was looking for a birthday bouquet and this one caught my eye. When I called to make the order, the team responded quite friendly. I'm very impressed. Thanks a lot for the splendid arrangement! Cute and feminine bouquet. Called to make the order and was pretty much surprised by the friendly attitude of the staff. Great company to order flowers from. I was looking for a cute bouquet for the mother of a new born baby. Then I saw this one and ordered it right away. It was delivered on the next day and the recipient said it looked amazing. Thanks a lot!!! Sweet! This bouquet is just made for me! It is a real fantasy! What can I say? I couldn't have asked for a better company to deal with! They are real professionals who responded quickly to all of my inquiries and delivered an amazing bouquet! Brilliant! Amazing selection of fresh flowers! Fast delivery times and friendly customer support. Ordered flowers online from Handy Flowers for my friend’s baby shower. The arrangements were beautiful, the flowers were fresh and the design was thought through very well. Will buy from here again. Flowers were just divine! Delivered them quickly and the cost was very competitive too. Finally – a company that has good old fashioned customer service! Love this company! My aunt received her surprise flowers the very next day and they really did put a smile on her face! Ordered this as an anniversary gift for my wife. She was really taken aback by them and I have to say, they are absolutely beautiful. Gorgeous arrangement. Would recommend this florist to everyone – The flowers were perfect and the service was 100% spot on. Found ordering the flowers really easy to do and the drivers who delivered were incredibly helpful. Communication throughout my entire order was top notch. Found the website really easy to use and the flowers went down well too.